Each time we mention javelina there are lots of questions about what a javelina is. Here’s a bit more information. Javelina (pronounced have-a-LEEN-a) is the common name for the collared peccary. Peccaries are included in the Order Artiodactyla (even toed ungulates), where you will also find pigs, hippopotamuses, camels, llamas, mouse deer, deer, giraffes, pronghorn, antelopes, sheep, goats, and cattle. 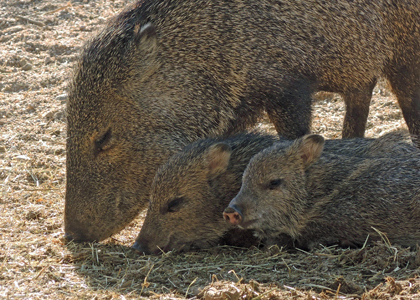 While peccaries resemble pigs, they are not pigs. Instead, they are part of the Tayassuidae family, while pigs belong to the family Suidae. Many physical characteristics distinguish the two families of animals. Peccaries have small ears and their tails are not easily seen from a distance. Pigs have upright ears and long, hairy tails. Peccaries have three toes on the hind food; pigs have four. Canine teeth (tusks) in peccaries are straight, while they’re curved in pigs (like wart hogs). Another interesting difference is that pigs give birth to large litters of helpless young, while peccaries generally give birth to twins, who are up and running with the herd shortly after birth. The collared peccary (Pecari tajacu or Tayassu tajacu), our javelina, is found in Texas, New Mexico, Arizona, and south into Argentina. They can weigh 40 to 60 lbs. and stand about 20” tall. Their coats are thick and bristly with salt-and-pepper coloring and a lighter band of hair around the neck and shoulders (which resembles a collar). Javelina will eat shrubs, grass, mesquite beans, cacti and various roots and tubers. The availability of food will often determine a herd’s location. Javelina have poor eyesight, but a good sense of smell. The scent gland on their back near the rump has a strong musky smell. Many people have said they can smell a herd of javelina before they see them. Members of a herd will rub cheek to hip (a javelina handshake!) to share this scent among the herd members. These individual scents, when combined, form a sort of herd perfume which they use to identify members of the herd. If you don’t smell like family, you’re not welcome in their territory. When they smell danger, javelina will freeze, let off that musky odor, and clack their tusks in warning. They may charge, but more likely, due to their poor eyesight, they’re simply scattering in all directions in an attempt to escape. It’s a good idea to be careful with your dog if you live near javelina. They are very alert for predators, especially coyotes, so they may react defensively toward a dog, especially if there are babies in the herd. Keeping your dog on a leash is a good idea, and avoiding areas where there are javelina herds will help to keep you and your dog safe. Don’t feed javelina and encourage your neighbors not to either, as this will draw them into your neighborhood and can create conflicts. There are many good sources for information on living with javelina. 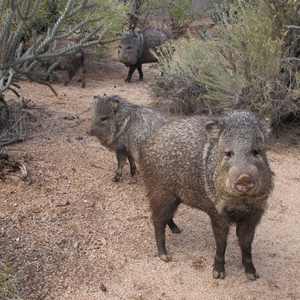 Check our EDUCATION - Living with Wildlife section for tips to avoid conflict with javelina. Arizona Game and Fish Department also has information on living with javelina.